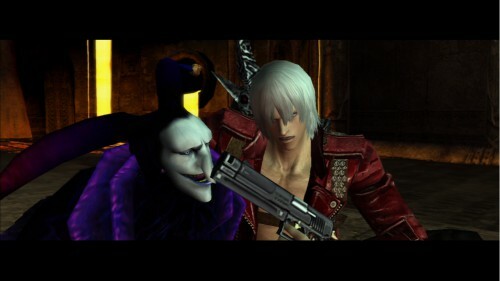 The story this time is about a young Dante, who has just set up the shop that would later be called Devil May Cry (later Devil Never Cry, but that apparently changed shortly after the first game’s finale), is invited by his estranged twin brother Vergil to a colossal tower that he has raising in the city, hoping to use both of their amulets given to them by their parents to claim the power of their father, Sparda. Amongst this Vergil is joined by a demonic priest called Arkham, who is pursued by his daughter, known only as Lady since she renounced the name her father gave her after he killed her mother to raise a demon, who intends to kill him with her own devil hunting skills. Dante is back to being cocky this time around, acting a little more wild and reckless which can be fun, though he does mature up when the situation calls for it. It also leads to some humorous banter with the boss characters, and gives the game a lot of levity. Vergil is Dante’s opposite; he’s cold and calculating, as well as being a badass with a katana, and proves to be much more entertaining villain than the previous games. Lady is probably my favorite of the DMC girls, with her no nonsense attitude and a decent amount of depth and character development, and an awesome fighting style using multiple firearms and a blade mounted rocket launcher with various firing modes. The plot is multi-layered too; the direction of the story keeps shifting as the game progresses and we are treated to cool reveal after cool reveal. In terms of the gameplay DMC 3 is a huge improvement; taking the feel of the first game and incorporating a new style system, which allows you to use some of the moves that DMC 2 tried to introduce. 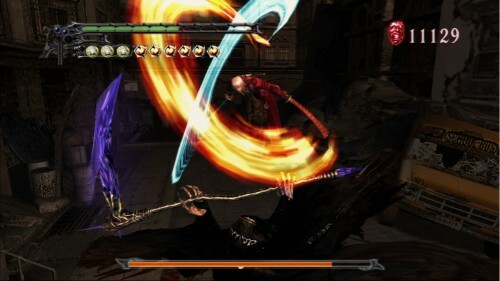 You can use a style that emphasizes new sword moves, which has different abilities for the weapons you come across too, a gunplay style which opens up new attacks like the bullet rain move or the ability to fire in multi directions, a trickster style for dodges and dash moves and the royal guard style which lets you block and then release stored energy into a special move. 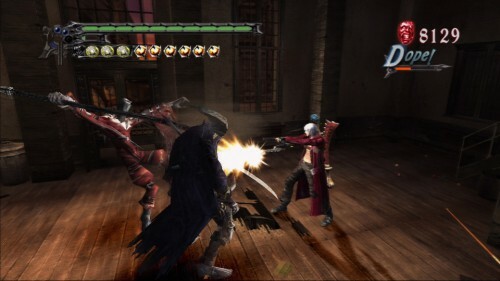 You later unlock new moves like double ganger which creates a clone of Dante with changeable AI settings like following your moves or being set to going off and fighting it’s own opponent to cover more ground, and a time dilution style which always seems to work its way into each of the games somehow. The problem is that you can only equip one at a time, so you have to work your way through each style to level it up. You can change your style at upgrade stations, though you don’t know what’s going to work the best the first time you play and don’t have the choice to change on the fly. You also get a new weapon from each opponent; including a triple linked set of ice nunchaku, a pair of fire and wind scimitars, light based boxing gloves similar to Ifrit from the first game, a multi-laser cannon, a sniper rifle, Lady’s rocket launcher and a scythe that transforms from an electric guitar (that is so inspired and awesome beyond words!). You can only equip two at a time, but they are a blast to play around with and find out how each weapon works. The Devil Trigger is downgraded however, to function more as a damage boost and a way to recharge your health, without the unique abilities of the first game or the customizable abilities of the second, though it can really change the tide of a difficult fight. All these new features come at a price though; this game is one of the most difficult games I’ve ever played. The enemies are relentless and you’re constantly on your toes in every encounter. I spent literally hours on the final boss on the hardest difficulty, but when you finally complete it after hours of patience and failure, you’re on top of the world! There are a few new modes too, like Bloody Place, which acts as a sort of survival mode with enemies getting harder as you progress, and the Heaven and Hell mode, where both you and your enemies die in one hit. However this mode is incredibly easy; all you do is a fire at the enemy and your done, unless you’re going for S-Rank. But even then this mode poses no real threat. In the Special Edition (which I highly recommend) you can even play as Vergil, though it’s essentially playing through the game again with no real change except for the gameplay style, which is based more around Vergil’s katana Yamato, though you get a few new moves like floating sword moves and different weapons like the aforementioned light gloves and a combination of Yamato and Sparda’s sword, which the style system is reduced to a dash move, though that to gets different applications like appearing above your opponents head for a downward strike. Overall DMC 3 is fantastic in pretty much every aspect. It’s challenging but fun, and it never felt like the game was unfair. The story is engaging and decently written, though it has a lot of action scenes committed to cutscenes, which you’ll either love or hate (and I love em!) If you love this type of game, it a must buy! This entry was posted in Uncategorized and tagged Capcom, Castlevania, Devil May Cry 1, Devil May Cry 2, Devil May Cry 3, Playstation, Playstation 2, Retro. Bookmark the permalink.